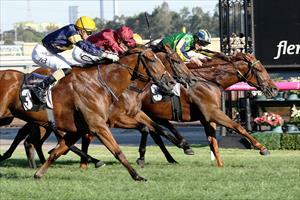 Rhythm To Spare and Strike Force represent the stable when they run at Moonee Valley on Saturday. Strike Force (pictured) is the first to go in race two, the Benchmark 78 Handicap over 1600m with Lachlan King reducing his weight to 56kg and jumping from barrier five. It is the fifth run this campaign for Strike Force who finished fourth at Flemington over 1700m last start. “He looks really well and he’s trained on nicely,” Mike Moroney said. “This looks a nice race for him and it shapes as though it will set up nicely for him. “He’s drawn to get the right run and if he jumps away he should be able to lead and run a similar race as his last start. Rhythm To Spare runs in the last race, the Open Handicap over 1519m where he too will have Lachlan King reducing his weight to 55kg but unfortunately drawn barrier 11 of 13. The nine-year-old was unlucky last start at Moonee Valley when charging home for second over 1600m and Moroney is anticipating better fortune on Saturday. “I thought he was most unlucky last start, getting stopped at the wrong time,” Moroney said. “It’s a strong race as you would expect but I do think the claim gets him in well and if he can jump away and get across it will be ideal, especially from the 1500m start.